Kumar Sangakkara looked relaxed and confident, patiently posing for photographs when requested by members of the groundstaff after a long net session and an examination of the pitch on Friday morning. At the pre-match press conference, he sounded unfazed by India's formidable recent record in Sri Lanka, pointing out that his side has also won two tri-series involving India this year. "I think the main reason is that they have lifted themselves for finals and they outplayed us," Sangakkara said. "You have to give credit to sides when they win, [but] we have been to lot of finals as well, we need to make sure that we lift ourselves tomorrow." 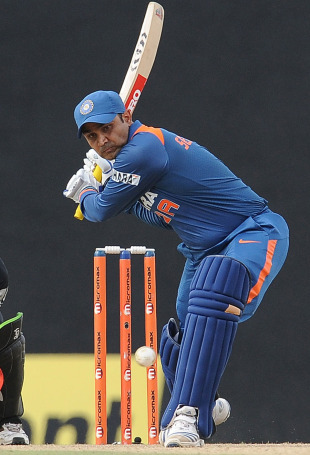 India's quick bowlers were spot-on against New Zealand on Wednesday, reducing them to 53 for 8. Sangakkara said facing them in a big match will be a test for his side. "The way the bowlers did on this track was encouraging for India, but our bowlers also have done the same," he said. "Both sides can take heart from that. These are tough conditions for batting, good sides try and win those challenges." Sangakkara said one aspect Sri Lanka needed to improve on was mental toughness, which would lead to more consistent performances irrespective of the conditions. "We want to be mentally stronger. I have spoken to the coaches and the board," he said. "It will be good if we can get a person who has knowledge of Sri Lankan players to address these issues." The stand-out batsman of the tournament has been Virender Sehwag, who almost single-handedly steered India to both their victories in the league stage. Sangakkara said there wasn't any special strategy to tackle him. "A lot of people have tried lot of plans against him," he said. "He's an excellent player. If you get him early, it's an advantage. I think it's just sticking to the basic lines and lengths to him." Right through the tournament, teams have been bundled out cheaply. Sangakkara said the key to making runs in Dambulla was to adapt one's game based on the pitch. "We can learn a lot from Sehwag. We can't play the same way everyday," he said. "It depends on conditions and situations and bowlers, you have to adjust. Sehwag has adjusted well." Recent contests between India and Sri Lanka have largely been controversy-free, but this tournament had the Suraj Randiv no-ball incident. Sangakkara didn't think relations between the sides were affected by it. "I think the players have got on with their jobs pretty well," he said. "You can't expect everything to go your way and have life easy, the tougher it is, not just me, the entire side has an opportunity to show character and build character. Our side is well on the way and let's see how we progress tomorrow."